My friend Mehrunissa, author of the beautiful blog come·con·ella, came for a visit last weekend and brought with her, amongst other things, some amazing yoghurt mojo that really opened my eyes to the versatility of this wonderful food. 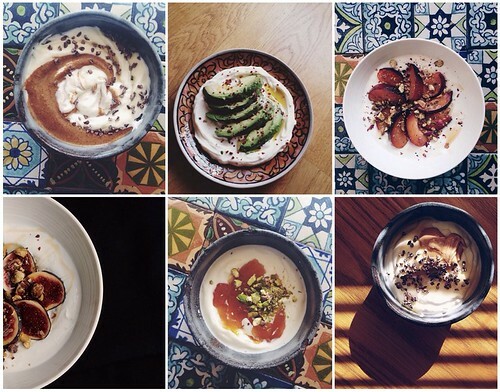 We’ve all heard of yogurt topped with granola or fruit compote, but Mehrunissa opened my eyes to the plethora of other foods – sweet and savoury – that make delicious yogurt toppings. What was the life changing yogurt topping that started it all? It was none other than my favorite: avocado, drizzled with just a touch of olive oil and a sprinkle of berbere (an Ethiopian chilli and spice blend). We ate it with rosemary farinata, Indian-style with our hands (another lesson from Mehrunissa), and hot tea: the perfect Sunday brunch. During the lunch we brainstormed other terrific toppings for yogurt. Here’s what we came up with. This list could probably go on forever with different permutations of various ingredients. 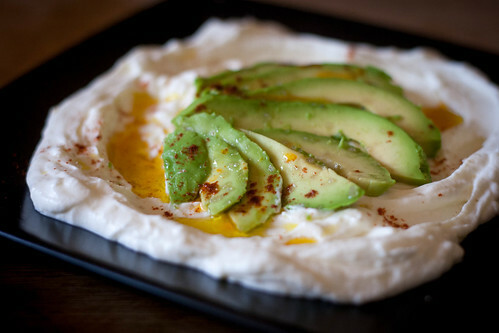 What are your favorite toppings for yogurt? For more inspiration, both yogurty and otherwise, follow Mehrunissa on Instagram and Twitter, and check out her blog, come·con·ella.